represents a Stratonovich process , where . represents a Stratonovich process with initial condition . uses a Wiener process , with covariance Σ.
converts proc to a standard Stratonovich process whenever possible. 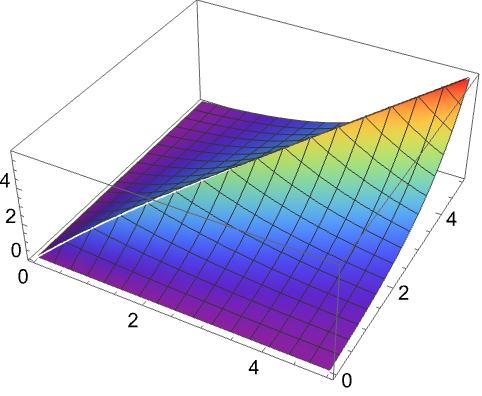 represents a Stratonovich process specified by a stochastic differential equation sdeqns, output expression expr, with state x and time t, driven by w following the process dproc. StratonovichProcess is also known as Stratonovich diffusion or stochastic differential equation (SDE). StratonovichProcess is a continuous-time and continuous-state random process. If the drift a is an -dimensional vector and the diffusion b an × -dimensional matrix, the process is -dimensional and driven by an -dimensional WienerProcess. A stochastic differential equation is sometimes written as an integral equation . The default initial time t0 is taken to be zero, and default initial state x0 is zero. The default covariance Σ is the identity matrix. A standard Stratonovich process has output , consisting of a subset of differential states . Processes proc that can be converted to standard StratonovichProcess form include OrnsteinUhlenbeckProcess, GeometricBrownianMotionProcess, ItoProcess, and StratonovichProcess. The stochastic differential equations in sdeqns can be of the form , where is \[DifferentialD], which can be input using dd . The differentials and are taken to be Stratonovich differentials. The output expression expr can be any expression involving x[t] and t.
The driving process dproc can be any process that can be converted to a standard Stratonovich process. 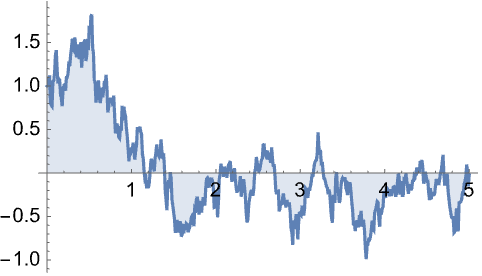 StratonovichProcess can be used with such functions as RandomFunction, CovarianceFunction, PDF, and Expectation.